HIGH POINT, NC - By its very nature, California's Sonoma County is restful and relaxing, creating a comfortable state of mind. It's a simple, understated way of life; think corduroy jackets, blue jeans, soft leather shoes. Fittingly, Marge Carson takes this same approach with its new Sonoma Collection. Comprising bedroom, dining room and occasional pieces, the group is contemporary but less adorned than what customers might expect from Marge Carson. "It's easy living in a contemporary way," says Director of Design Mike Gohman. "And it's a bit smaller in scale - perfect for, say, urban loft living." While the collection represents a departure for the company, it's not so far afield, either. "Sonoma, in some ways, takes us back to Marge Carson's roots," says owner and CEO Jim LaBarge. "In the early days, our success as a new manufacturer was in the use of textures, stitched leather, stone, metal and soft wood finishes that came to be known as the 'California Look.'" Thus, the California connection comes full circle. Sonoma is absent of frills and abundant with comfort, characterized by simple materials, textures and forms that invite you to lean back and relax. Crafted using rich cherry veneers, the Sonoma Collection features two new finishes - a soft brown, low-sheen called "Calais" (a place in France that reflects a similar rural-but-rich sense of casualness) as well as a lighter, water-marked sunset finish called "Sonoma" which, in some cases, has been combined with the existing Marge Carson finish "Distressed Kona" to create a dramatic two-tone look.  But, as typifies the entire Marge Carson line, the true difference is in the details. Simple inlays of Makassar ebony are sparingly used, defining and accenting select pieces, while hand-wrought textured metals feature soft leaf finishes with a bronze patina. "The unique chiseled surface we developed for much of the metalwork adds a visual, tactile texture to this contemporary collection," says Gohman. "Light reflecting off this surface has a glinting shimmer, much the same way that light reflects off a stream of water." 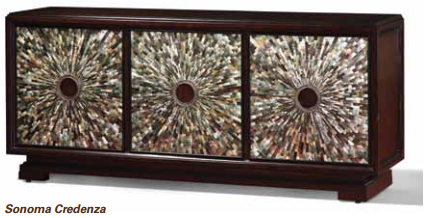 Among the signature pieces of the Sonoma Collection is a spectacular 85-inch-long credenza; fronted by an inlaid shell surface that forms a sunburst pattern, it beautifully represents this group's artful mix of materials. 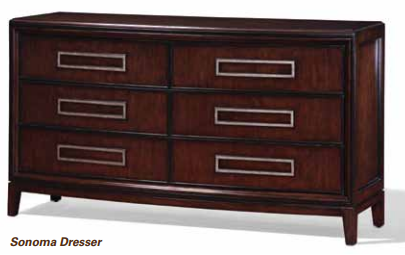 "The inlaid shell surface is used as a face treatment on the credenza as well as select table tops," Gohman explains. "We wanted a surface that was unique to the collection yet complemented the casual direction. Choosing the sustainable shell material was ideal, and inlaying it as a sunburst pattern, allowing its varying thicknesses to create texture, was an unexpected treat to the eye. And as is typical of Marge Carson - "options" is our middle name - we offer the inlaid shell in three distinct colors: Pearl, Pewter and Raven." 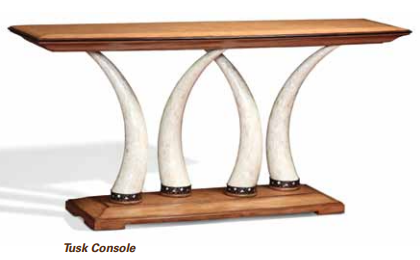 Equally stunning is a console with tusk-like supports wrapped in shell and detailed with pierced brass collars, a "flavor" piece added to the group to give it a more collected look. Meanwhile, sculptural metal supports - like loosely arranged monolithic structures - create the bases of an extension dining table and simple console. Metal comes into play, too, on chairside and cocktail tables, their hand-hammered bases giving them a Mondrian-like appearance. Taking attention to the nth degree, even the hardware is exquisite. The clean-lined, cast brass pieces are more than functional; featuring a pebbly stingray texture, they're more like jewelry - the perfect finishing touch to any ensemble. Founded in 1947, Marge Carson, Inc. is one of the world's premier manufacturers of high-end residential furnishings, including upholstery, case goods, occasional pieces and decorative accessories. With more than 55 finishes and 600 fabrics, embellishments and leathers to choose from, Marge Carson is known for completely customizable pieces. Marge Carson's 24,000-square-foot showroom is located at 121 N. Hamilton St., High Point, NC.